Gammon, carrot, courgette and pak choi stir-fry, coated in a sweet & sticky sauce, served with brown rice. Preparation: Boil the kettle. Prepare all ingredients as indicated above. Carrot & courgette matchsticks: Cut in half crossways. Then cut each half lengthways into slices (½ cm thick) and cut each slice into matchsticks (½ cm). Brown rice (parboiled): Pour boiling water (¾ cup for 1) into a pot on high heat and add the rice with a pinch of salt. Bring to the boil, cover, turn heat down to low and gently simmer for 18-20 minutes. Drain. Sauce: Mix together the soy sauce, rice wine vinegar, oyster sauce and sugar. (You can use HALF the quantity of sauce for this recipe, just add more to taste). Ginger: Place a pan on medium-high heat and drizzle in the peanut oil. Add the ginger and sauté for 1 minute until lightly golden. Remove and set aside. Gammon: Remove any large pieces of fat (optional). Using the same pan, on medium-high heat, add the gammon and cook for 4-5 minutes until golden and cooked through. Remove and set aside. Veggie stir-fry: Using the same pan, turn the heat up to high, add the carrots, courgettes and pak choi stalks and cook for 3 minutes. Add the pak choi leaves, gammon and HALF the sauce and sauté for 2 minutes until the leaves have wilted. Serve by mixing the REST of the sauce through the rice, top with the veggie and gammon stir-fry, ginger and coriander leaves. Drizzle with HALF the quantity of sesame oil (you can add more to taste). "The stir fry I make always tastes the same. 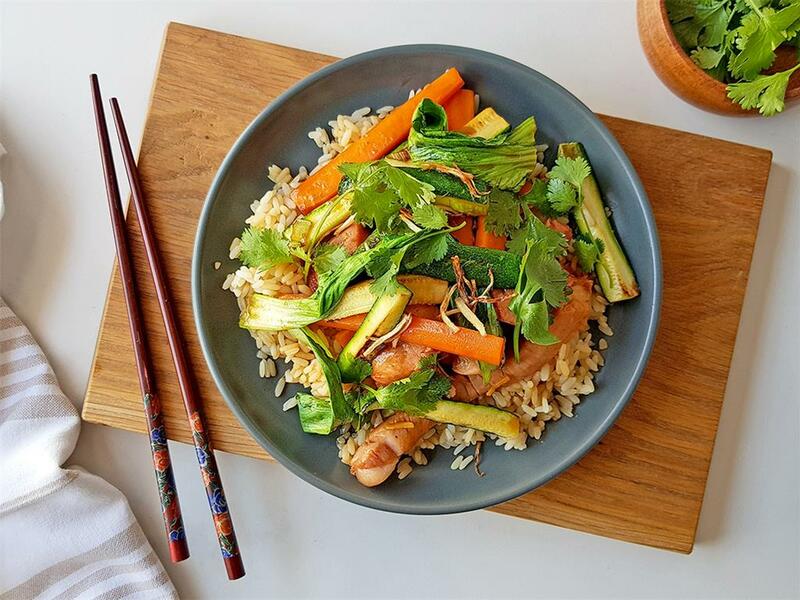 This recipe introduces new ingredients and a new way to make a delicious stir fry. Maybe a bit too salty but may have been an error on my part."